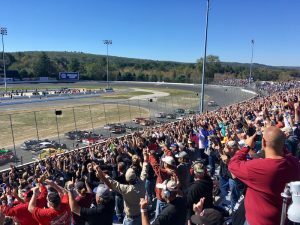 STAFFORD – Keith Rocco climbed from his SK Modified in victory lane at Stafford Motor Speedway Sunday and the emotion began flowing immediately. In the days leading up to Sunday’s final SK Modified event of the season at the NAPA Fall Final at Stafford Speedway, Rocco emphasized that he was coming to the track on a focused mission to win the division championship in memory of his mentor, competitor and friend Ted Christopher. Sunday he completed that mission. Christopher, the all-time winningest driver at Stafford Motor Speedway, was killed in a plane crash on Sept. 16. After seeing Christopher’s No. 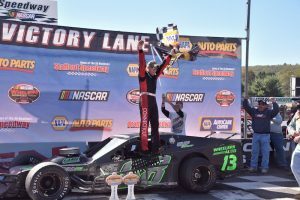 13 retired to start the day at the track, Rocco won the 40-lap NASCAR Whelen All-American Series SK Modified feature Sunday to capture his third career championship in the division at Stafford. Chase Dowling of Roxbury, Rocco’s closest competition for the championship, was second. Todd Owen of Somers third. On Sept. 22, in the first event at Stafford following Christopher’s death, Rocco won the SK Modified feature. With Dowling involved in a crash that evening, Rocco’s first victory of the season that night erased a 34-point advantage in the standings for Dowling and put Rocco ahead of him by four points going into the season finale. With Dowling holding the tie-breaker against Rocco, it meant Rocco had to either beat Dowling or finish no worse than one spot behind him in the feature to win the title. Prior to the start of the race the 24-car field ran three-wide pace laps in honor of Christopher while fans held up one finger on one hand and three on the other. Early in the event Dowling got by Rocco, but on lap nine Dowling was involved in a turn four crash that nearly also collected Rocco. Rocco took the lead from Ronnie Williams on lap 20 and never trailed again. Dowling clawed back through the field, but never was able to mount a challenge on Rocco in the closing laps. Rocco, who had SK Modified championships at Stafford in 2008 and 2010, spent much of his teen years as a crew member for Christopher before getting his shot to race against him. Rocco said the championship played out just as Christopher would have wanted it. “One thing about me and Ted, there was never any jealousy between us,” Rocco said. “If I couldn’t win I wanted him to win and if he couldn’t win it was the other way around. We laughed and joked about it. A FITTING END TO THE SEASON, ENOUGH SAID! Rocco. No longer in Christopher’s shadow. The top dog. Has the skills, talent, long list of wins and everything else it takes to be successful for a long time. I’m going to enjoy hating him. That’s racing hatred which is more like admiration turned 180 degrees and formed into a reason to get excited about any race he is in. Kind of like Christopher. Has an excellent chance for the championship at all 3 tracks. Has this ever been done before? Dareal must be foaming at the mouth at this point. As much as Rocco is good at what he does unfortunately I don’t believe he will ever be a Ted Christopher. There will never be another TC because of the ability, talent and determination TC possessed. His personal qualities as an indivudual also put him in a class above others in the racing community that won’t be matched. Wow big tech at Stafford. Shocks, springs, cylinder heads, bore, stroke, intake carb, etc… Not a lot for the haters to hate. That car rips. I love Keith Rocco . Just the illegal left rear spring that was piled with spring rubbers but I guess just throw the rule book out the final race of the year! John Davis, show me in the 2017 where what you mentioned is illegal. I’ll save you the time because you will be searching the rest of your life. The late model rule (and all fendered divisions) book has a one rubber per spring limit. There is nothing mentioned in the SK modified 2017 rule book concerning spring rubber use. So, because you don’t think of something and someone else does makes your argument sour grapes, not fact. Rocco did his homework and it paid off very handsomely. Congratulations to him and his team and all backers. Chase Dowling had a great remarkable year as well so congrats to him as well. Sometime before the season Buckler did an interview on what appeared to be a cable channel with Mike, Ted and Mike Jr. You can see it on youtube. Fascinating all the way through. One point Ted made was how much he enjoyed the old days racing with Gunning, Anderson and Mike of course who he said was no more then another number to beat as far as he was concerned. He also said that it’s tougher now since on any given night any one of 12 guys could win. Sadly he’s gone but the fierce competition is still there. We saw that in the SK race where they are racing lap after lap in a pack that has 16 cars. What if’s are dangerous. Nonetheless what if Dowling hadn’t got caught up in the melee and used his tires up coming from the rear. What if it was Rocco that had to get by him. Now that would have been interesting. Rocco is the man. He came in first and fifth. First with him driving and 5th with the car he rented to Gervais. “the above” referring the the part of the rules outlining the free travel of the spring. Isn’t a rubber coil bind? If rubbers aren’t coil bind what is? Any SK experts out there? Hopefully in the future there will be another driver who can have the ability to drive in multiple divisions……and win……..Rocco is a local has been…..and that’s okay for the local fan….. I read the rules myself and find it pretty clear, there is not rule on spring rubbers so you can do whatever the heck you want in that department. The part you quote is referring to travel limiting devices. The rule is meant to only allow the spring to control the movement of the suspension, that means no bump stops or coil binding or having the spring collapse till its solid steel or each coil is touching the next with no space or free play between the coils. Chains, preloaders, etc that are designed to limit the travel in either compression or rebound are not allowed. Spring rubbers simply do not do that. They raise the rate of the spring. Big deal. Everyone can do it, go ahead. By the way, the spring rubber rule in the fendered divisions is a Stafford rule while the movement controlled by the spring only is a NASCAR rule for all Whelen All American Series divisions. I haven’t seen anybody compare Keith Rocco to TC or proclaim them equals yet, but Jeff goes out of his way to bash Rocco every chance he gets. The fact is that Ted and Keith were very close for the last 15 years and he’s obviously very upset and shaken up by the events of the past 2 weeks. For you (or anyone else) to come onto this site and purposefully (and maliciously) demean him because he’s a “has been” is beyond cruel. Of course…I’m not sure how someone who is 31 or 32 years old with about 12-15 track championships is a has been, but whatever. Pretty sure he’ll also have about 20 wins or so too this season. And that’s an off year. Good call there professor. Seems to me if spring rubbers are nothing else they are binding two coils together. Increasing the rate, reducing the travel and stiffening the spring. Nonetheless it’s clear they are AOK in the SK’s thanks to Stuart Fearn for a terrific answer from an expert. Some day there will be good hearted banter about who the greatest modified driver was. One Mr. Richie Evans comes to mind right off the top. Chick Stockwell had Christopher like moves and Don LaLoie was an innovator ahead of his time at the Danbury Race Arena. Reggie Ruggiero had some of the quickest moves ever in a modified. Bob Potter deserves consideration as well. And the list goes on and on. Keith Rocco who has a very long resume now is still just a kid. If you project the same level of winning for a decade or two he may end up in a class by himself. It’s too soon now for comparison. Christopher who was the devil in life for some has become a flawless saint in death for others. Too much emotion. Time always puts these things in perspective. Rocco did his homework by getting Teddy’s Setup from Teddy’s crew chief? Maybe you need to do your homework because per the WMT rule book (which stafford does go by) you cannot have more then 2 spring rubbers at a time in a spring. So yes running four spring rubbers in a 100 pound left rear spring is illegal but that’s SMS inconsistent tech at it’s finest like normal! You are correct in analysis, just remember that if it’s not in the Stafford sk rule book, the modified tour book is used. Just ask the 15sk last year with the caliper mounting issue. If two are allowed and that’s what Keith had, so be it. Nice job to the 88, finished out the year strong. What’s with the chip on your shoulder John. Since Stafford has always been a leader in stipulating their rules by division they clearly don’t go by the WMT rules. They go by the SMS SK rules that are there for you and all to read on the web site. And I gotta tell you they don’t say Stafford Motor Speedway SK Rules……….refer to WMT Rules. They outline in detail what they require. They invented the SK division of Pete’s sake. If they reference WMT rules and defer to them for a specific section John just look it up, copy and paste and share it with us. That would be homework. Otherwise it seems to be accusing Rocco for being stupid in doing something illegal that is so easy to spot and calling the tech crew corrupt for not penalizing him. Rocco is clearly a very bright guy the tech crew deserve a lot of credit for doing a very hard job very well. And do we even know if this rubber thing ever happened? I don’t no ask Kieth when he went back to his trailer during tech cause he didn’t want to no a thing. And the tech official paced back and forth wondering what to do??? So a little obvious that Kid rock was junk all year then all of a sudden the last two races he is light’s out and has to cheat to win the championship. Thought he was better then that. John, for the last two races Keith Rocco was using a different car. It’s the one he’s been running at Waterford. Sounds like you were there John and are worked up about what you saw. Maybe there is some smoke there. Problem is you’re jumping from what you saw to accusation. Regardless of the rules it would be nice if you could be more specific on what transpired. Maybe throw in where your loyalties lie as well. Not that it is relevant but the penalty notices haven’t been published yet. Keith’s car was inspected as all winners are! Spring rubbers? Really? Don’t hate on winners!!! Whatever happened to giving credit where credit is due? WOW John Davis! Don’t hate, emulate!! John Davis,if you know so much about Keith Rocco, you would know he always leaves tech in order to remove his drivers suit, that is why you have crew members to remove what they want to inspect anything else you want to complain about. Didn’t Rocco lead the points till late august when his motor blew up? I mean he wasn’t great since then but let’s get real, you can’t win a championship in 2 weeks. I don’t care for the kid but he finished in the top 5 a lot. I wasn’t in tech myself but if Rocco had the LR spring covered with a wrap that is the the most hilarious thing I’ve ever heard! That’s the oldest trick in the book! Don’t tell anyone though because it always brings great laughter afterwords!